FUD. A term that not many of us may have used but have certainly used as a strategy. As I was reading up on some books on Open Source, I came across this term and read up on its definition in Wikipedia (Oh! what would I do without you!!). FUD - Fear, Uncertainty and Doubt. It kinda reminds me of what you'd feel like if you were facing the Black Gate of Mordor. Bile rushing up your throat, you become uncertain about your actions and doubt creeps in. Its worse when you stop believing in yourself. Self doubt more like? Just imagine you are running a business and you choose to go with Open Source tools. It may be because of the financial situation or just cause you believe in Open Source. In comes a competitor or just someone who actually wants to help. He creates a situation or utters something meaningless. Or should I say with just enough meaning to make you think twice on the steps you are taking. You face the Gates of Mordor through again!. Wikipedia mentions in its article - "By spreading questionable information about the drawbacks of less well known products, an established company can discourage decision-makers from choosing those products over its wares, regardless of the relative technical merits. This is a recognized phenomenon....."more here. Its kinda disgusting to see that this is an accepted business strategy and well, part of business ethics. Ethics as in, its an accepted practise!!. Well, its also quite ironical to see that though IBM was accused of starting this practise, it itself was at the receiving end when SCO launched a series of FUD attacks against it!!. Well, how can I talk about Open Source and FUD and not mention Microsoft in the same sentence? Hehe, I just did it!!. Also reading up on this incredible book - "Open Sources - Voices From The Open Source Revolution" and some information on the web (more like Wikipedia), I came across the Halloween Documents. These were a series of internal memos and whatnot that Microsoft was circulating amongst its staff about Linux and the Open Source Movement. Its kinda funny that though Microsoft is so derisively dismissive of Linux et al in the open, its actually a little worried about the inroads that Open Source is making!!. These documents have been comprehensively ripped by Eric S Raymond and he has done a great job of it. You can read up on Eric's article here and the Halloween Documents FAQ here. Want to join the bandwagon? 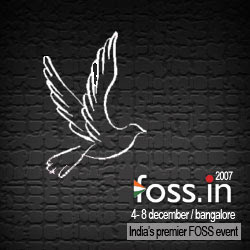 Be part of the FOSS Exhibition in December this year! !.